Do you want to have a transformative experience in the classroom? Do you want creative, interactive ways to address the Common Core and NY State Arts Standards? Do you want to see students' ideas and energies engaged in constructive ways? Do you want to bring the arts back into your school? Are you PASSIONATE or TERRIFIED or CLUELESS about SHAKESPEARE? 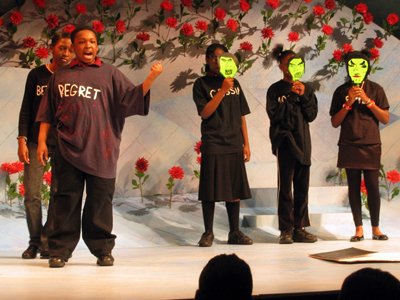 Founded in 1993 on the belief that Shakespeare is best learned in the act of performing his words, CAT's NYCSSF has provided over 10,000 young people and 400 teachers with a chance to create their own work of original theatre using Shakespeare's text and to perform their work on an off-Broadway stage. NYCSSF is a unique opportunity for educators and students to celebrate the raw power, dazzling beauty, and timeless, universal themes of Shakespeare's work. Click here for a map of the schools that have participated over the past 20 years! 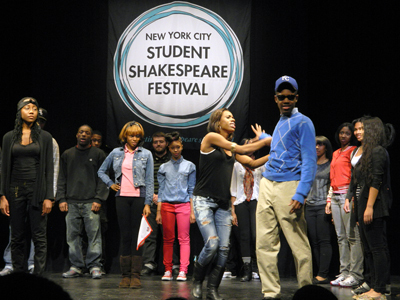 NYCSSF in the "Shakespeare in the City" blog. "CAT's Festival was one of the most rewarding things I've ever done in my classroom." "I was thoroughly impressed by CAT's training, the support from the teaching artists, and the way my students grew as a result of their experience." "I've been with the Shakespeare Festival for many years, and this has been the best year yet! It amazes me that the Professional Development days and the Teaching Artists just keep getting better and better. There's always more for me to learn and try out with my students." CUNY-CAT is an approved New York State Education Department Sponsor of Continuing Teacher & Leader Education (CTLE). NYCSSF is supported, in part, by public funds from the NYC Department of Cultural Affairs, in partnership with the City Council, and from the New York State Council on the Arts with the support of Governor Andrew M. Cuomo and the New York State Legislature. Professional Development Fridays for Teachers - 10-15 hours of interactive, hands-on professional development that will prepare you to lead your students in the creation of an original work of theatre using Shakespeare's text. Fridays at CAT in the winter & early spring, 9AM-1PM; breakfast and CUNY Certificate of Participation provided. CUNY-CAT is an approved New York State Education Department Sponsor of Continuing Teacher & Leader Education (CLTE). CUNY-CAT is an approved NYC DOE Vendor. In-Class Mentoring - A representative from the festival's team of Shakespeare experts will visit your classroom three times to provide you and your students with support and guidance as you develop your scene for the Festival. Culminating Performance - In mid-late April, you and your students will join groups from across the City as you all present your 5-8 minute scenes at the historic off-Broadway Lucille Lortel Theatre. During your Festival day (9Am-2PM), you and your students will also be treated to Shakespeare-themed games and activities, feedback by teaching artists and peer groups, and official recognition of the strengths or innovations of your work. Materials - You will receive comprehensive resource guides and thorough lesson plans from each professional development. Students and teachers will receive gifts, such as Shakespeare texts and wristbands or other swag. All involved will receive CUNY Certificates of Participation. The Festival experience will be archived through video and photos so that you to share your successes with your students and colleagues. To provide ELL and special-needs teachers with a means to offer high-expectation subject matter and strengthen students' abilities in literacy and theatre skills. To support the integration of student-centered learning strategies into the participating teachers' fundamental approach. To provide teachers of grades 2-12 with the tools to overcome discomfort and develop strategies for integrating Shakespeare (and other "difficult" works) into the classroom. 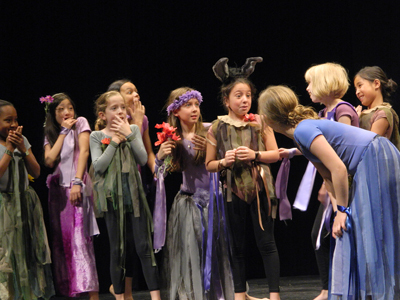 To complement existing school drama programs and fill a need in schools that do not have them – by providing opportunities for students to play active roles onstage, in scene development, and in stagecraft. 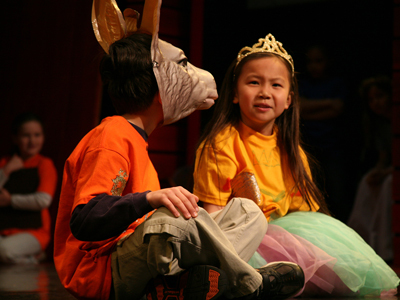 To bring a worldly and high-caliber level of theatrical knowledge to participating schools. 94% of participating students reported that, after participating in the program, they are more familiar with the elements of theatre, have a better understanding of Shakespeare, are more comfortable listening to the ideas & opinions of others and working together to solve problems. Javier writes, directs, and teaches theater in New York City and is the Artistic Director of Caborca. Productions of his original plays and adaptations include Zoetrope (Pregones Theater), Open up, Hadrian (Magic Futurebox), FLORIDITA, my Love (Teatro LA TEA /IATI Theater), Barceloneta, de noche (Union Theatre, London/IATI Theater, NY), Un instante en una especie de flash, (Yerbabruja, Puerto Rico), Never as Happy-Oresteia (Theatre of the Riverside Church), Uneventful Deaths for Agathon (FringeNYC) and Las minutas de Martí (Repertorio Español). FLORIDITA, my Love was published by New York Theater Experience as part of the anthology Plays and Playwrights 2011 and also online at Indie Theater Now along with Open up, Hadrian and Uneventful Deaths for Agathon. Other plays include: THE FUTURE OF BOOKS, The Actor in Spite of Herself and Dogwood. As a director, in addition to his own plays, González has collaborated with the painter John Ransom Phillips on his multi-media performance piece Mommy in Four Acts, and has also created multiple site-specific works in Puerto Rico and New York. González has been a member of the Public Theater’s Emerging Writers Group, a Van Lier Directing Fellow, an Associate Artist at Classic Stage Company, and was named a NYTheatre.com “Person of the Year” in 2010. He holds an MFA in Directing from Columbia University. David is an actor, teacher, and producer living in Brooklyn. He has performed at the Public Theater, Theater for a New Audience, Classic Stage Company, The Skirball Center, Peak Performances at Montclair State University, and Joe's Pub and has worked with artists such as Richard Foreman, David Gordon, Elizabeth Swados, Len Jenkin, and Adam Rapp. David has also worked often with some of New York's most innovative independent ensembles including Stolen Chair, Dangerous Ground Productions, PL115, The Representatives, and Caborca Theatre of which he is the Associate Artistic Director. He has played some of Shakespeare's most coveted and/or interesting roles in Romeo and Juliet, King Lear, Twelfth Night, A Midsummer Night's Dream, Titus Andronicus, Cymbeline, The Comedy of Errors, and Love's Labour's Lost, and was chosen for the highly selective Public Theater Shakespeare Lab in 2011. He has taught Acting and Movement at Columbia University and New York Conservatory for Dramatic Arts, as well as workshops for DreamYard Prep, The New School, and the German State Theatre in Timisoara, Romania. David holds a BA from Harvard and an MFA from Columbia. Laura has performed and offered theater workshops in Berlin, Japan, Romania, Italy, US, Australia, Colombia, and Puerto Rico. She was a movement Coach for Love’s Labours Lost, a Columbia University’s thesis, directed by Andrei Serban. Laura studied Voice & Speech and Shakespeare with Kristin Linklater and worked alongside Thomas Butts in Romania with the German actors company (Teatrul German de Stat Timisoara) coaching movement and speech for various Shakespeare monologues. She is an Artistic Director of One-Eighth Theater (UBU, The Proposal, and Cho H Cho developed at Mabou Mines), a co-founder of Cloud of Fools Theater Company (The Whistling Mortician and EUROPA), and an associate member of CABORCA Theatre (Zoetrope, Open Up Hadrian, and Las Minutas de Martí). Taught Acting I for Columbia University’s MFA acting class of ‘13 (Adjunct Assistant Professor). She is currently Faculty for the New York Conservatory for Dramatic Arts where she has taught Voice and Speech, Movement, and Vocal and Physical Dynamics for Camera. She has acted in: Comedy of Errors (NYC and Germany), Three Gifts for Lenny Bruce (Target Margin Theater Lab), so go the ghosts of méxico (La MaMa Theater); On The Beach (curated by Robert Wilson, BAC), Castle of Giants (The Windmill Factory), among others. She holds an MFA in Acting from Columbia University, and a BA in Drama from the University of Puerto Rico. Ashley Nease is a theater maker, puppeteer, vocalist, and fundraiser. She strongly believes that art and empowered imaginations are necessary to create positive change. She works as Development Director for The Other Side Intercultural Theatre (TOS), and Coordinator for CAT's NYC Student Shakespeare Festival. When she isn’t happily searching for grants for TOS, or cheering on young performers who boldly reach past their comfort zones, she can be found performing new plays with New Circle Theatre Company and tree hugging in Green-Wood Cemetery.